In my last post, I talked about a SWOT analysis from your customer’s perspective. In particular, I discussed analyzing your Strengths and Weaknesses from their point of view. Today I want to talk about expanding your product/service offerings. In today’s economy, many businesses are looking to drive more sales with increased service/product lines. Before you take the dive, I would encourage you to do a SWOT, focusing on the Opportunities and Threats of adding these new items. Whenever we are talking about selling something new, I like to evaluate it on a couple of criteria. First, are you selling complementary product to an item you already sell, or are you venturing into an entirely different market? For instance, let’s say you are selling televisions in a retail store. You realize that people buying your TVs are also purchasing furniture, like tables and cabinets to place their new TVs on. You could expand your business to include complementary furniture and earn more revenue from the same customers. At the same time, you could decide to sell kitchen appliances in your TV store. This would be an entirely different market – people buying TVs are not necessarily going to purchase a refrigerator at the same time. This is important to segment because you are talking about the same target market (your current customers) in a complementary expansion of your business lines, but a different target market when you are expanding lines into non-complementary lines. Here is where the SWOT analysis comes into play. 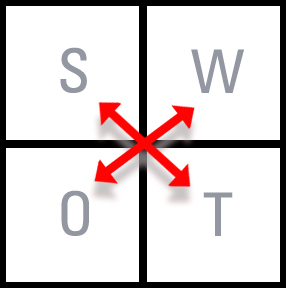 When we do a SWOT for a new line, I like to focus on the O and T: Opportunities and Threats and do a cross comparison to the S and W: Strengths and Weaknesses. Let’s take a look at Opportunities using our furniture and kitchen appliances illustration from above. By selling the complementary furniture, I am earning more of my current customer’s dollars instead of letting them go out my doors and spending their money on furniture elsewhere. What Threats are there to adding this complementary product? For one, people are mounting more and more TVs to the wall instead of resting them on cabinets and tabletops. Another threat would be cheaper furniture than you are offering. If the local big box store is selling pressed board TV tables, you may not be able to compete with them on price. Now let’s examine the non-complementary kitchen appliance lines. The Opportunity would be to become more of a one-stop home furnishings store rather than just a TV shop. In theory, everyone needs kitchen appliances just like everyone uses a TV. You may be able to expand your sales by drawing in customers who were looking for a TV and now become aware that you sell kitchen appliances, and vice versa. You have an awareness marketing opportunity every time someone comes into your store looking for one item or the other. The Threats in this situation could be that people don’t buy kitchen appliances as often as they do TVs. You will have to carry a large inventory and will need more capital to run your business. TVs are often sold more impulsively than kitchen appliances (I am not sure I have known anyone to buy a new dishwasher because the Super Bowl was being broadcast.) You will have to change some marketing tactics. Now let’s do some cross comparisons. When you listed your Strengths and Weaknesses from the perspective of your customers, I suggested you look the times your customer had a positive experience and list this as your Strengths. Likewise, I suggested you take a negative experience – especially when you lost a customer – and list it under your Weaknesses. Here is where I like to do a cross analysis (you can reference the SWOT chart above.) Compare your S with your T. Are there items that you listed as Strengths that will be jeopardized if the Threats come into play? In other words, will your customer’s positive experience suffer because of the Threats if you add the new product/service? If so, rethink what you are doing. Now cross compare the W and the O. Will you shore up any of the negative experiences of your customers if you start selling the expanded service/product lines you listed under Opportunities? If so, move ahead with the new lines. Adding new items to your product/service offerings can be a source of growth for a business or it can be their undoing, especially if the customer feels like you have lost your true niche and watered down what you do best. Applying a SWOT to your strategic planning helps avoid problems. If you have questions about getting a SWOT analysis of your situation, contact me.